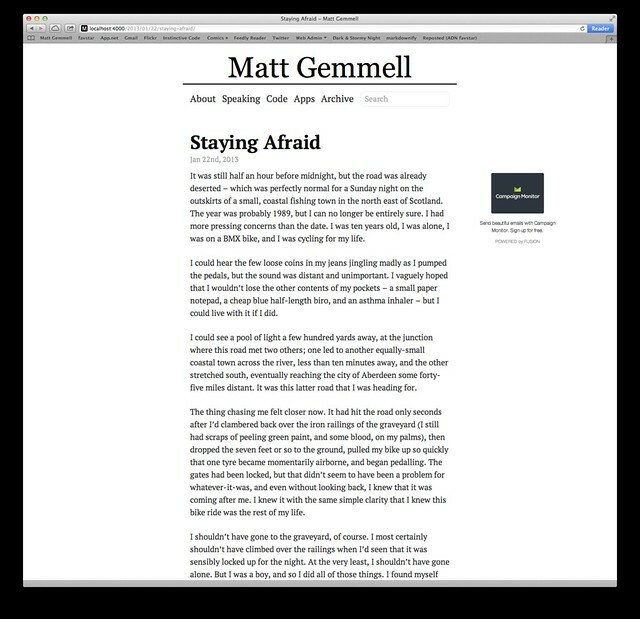 As will be immediately obvious if you’re reading this in a web browser, I’ve redesigned mattgemmell.com - yes, you’re still in the right place! I’ve wanted to change that theme for some time now, and I’ve finally been motived to do it by the clean, readable presentation of The Magazine, Medium, and indeed the new Loop Magazine (I wrote a piece for the inaugural issue, you know). The header has been redesigned. The typography is now serif-based, rather than sans. The theme is now more responsive to varying screen sizes and devices. 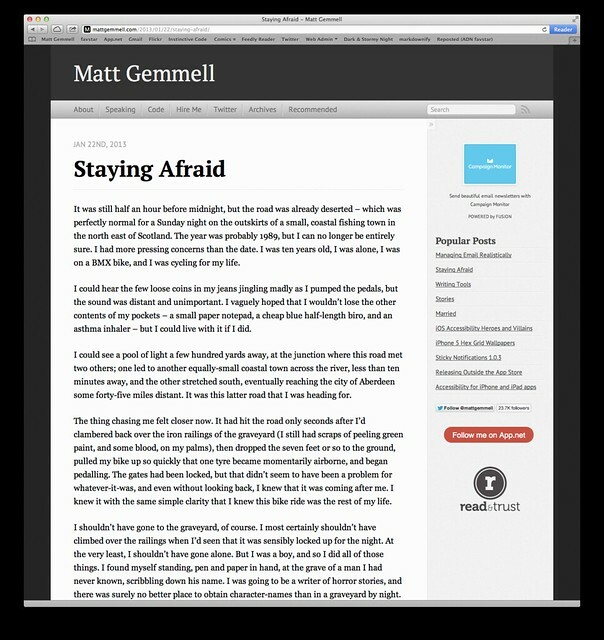 I’ve integrated the default Octopress theme’s responsive mobile navigation. I added my footnotes popover functionality. Purple is my favourite colour, so it’s the active/hover link colour rather than the usual blue. I’ve kept the dark red visited-link colour, for contrast. The header navigation has been simplified. I’ve made my About page a bit briefer. I’ve removed (almost) all sidebar elements, except for the one and only ad. It should also work well on your beloved iOS devices too, as the following screenshots show. 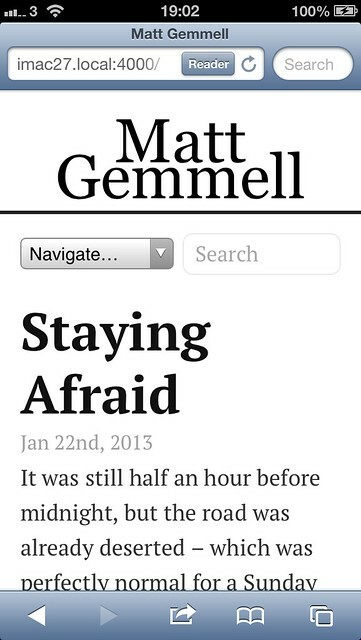 The article shown in each screenshot is Staying Afraid. 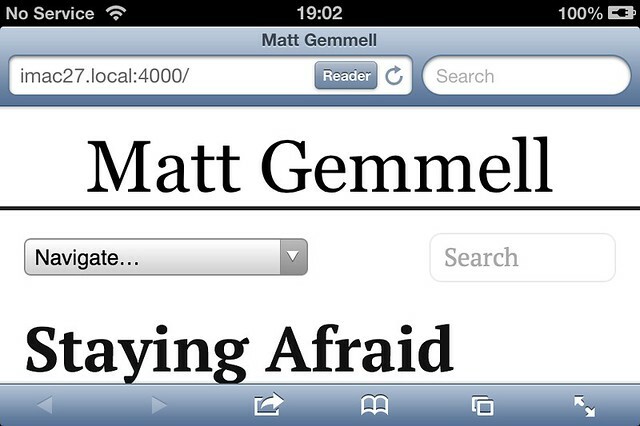 This layout uses the mobile navigation popup-menu, to avoid having lots of tiny links. The additional horizontal space on a landscape 4-inch display allows the full navigation to be shown. There are inevitably some rough edges, of course, and I’ll be continuing to test and tweak the design over the coming weeks. I hope you’ll find the new design more pleasant to read and browse. My hope is that the cleanliness of the design will not only be more comfortable for you, the reader, but will also encourage me to improve my writing’s focus, succinctness and indeed frequency. In the worst case, it’ll at least look that way. As ever, thanks for reading.